If you think of Dallas, Texas and images of bucket hats and horses dance in your head, you are only half right. This city offers so much more than cowboys and rodeos. In other parts of the country I am sure ya'll (just kidding, I never say ya'll) assume we send our kids to school by horseback and spend our free evenings on mechanical bulls. I assure you that Dallas/ Fort Worth (DFW) is a modern thriving area. I sometimes go a whole week without laying eyes on a cowboy. 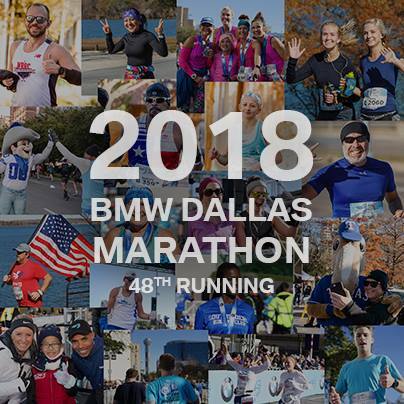 Dallas is a large metropolitan city with all the modern conveniences, restaurants, entertainment and nightlife that you would expect of a large city. It's just a stone's throw from Fort Worth, which while also boasting a modern city life, has a genuine laid-back country feel. If you were to come visit me in my city I'd take you to all the touristy hot spots. We'd go to the sixth floor museum at Dealy Plaza for a little JFK history learnin' and we would take a tour of the Cowboys stadium in Arlington (although, for the record: Go Steelers). We'd have dinner in the Reunion Tower, visit the Dallas zoo and of course swing by the historic Fort Worth Stockyards. But this is not going to be that kind of tour, I am going to take you on a virtual fitness studio tour of DFW. 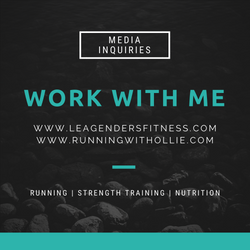 We are going to check out the hottest fitness studios in all the best Dallas and Fort Worth neighborhoods. 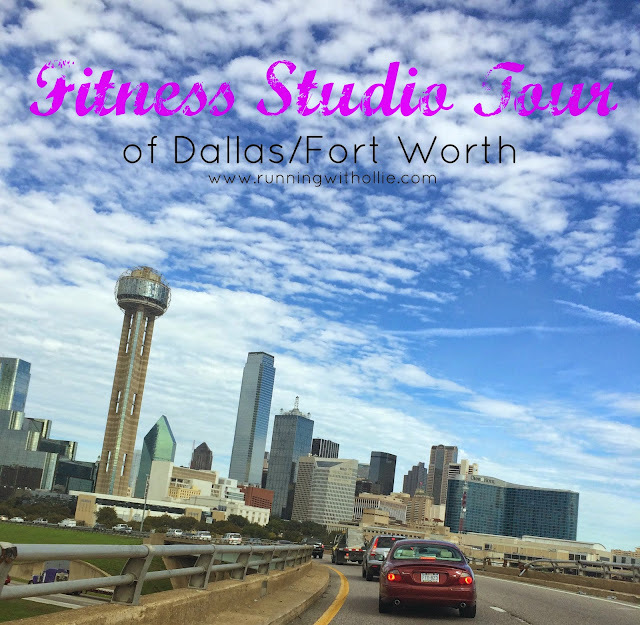 Come along with me as we go on a fitness studio tour of Dallas. "It doesn't get easier, it gets more achievable." Rain Rain, That's okay. 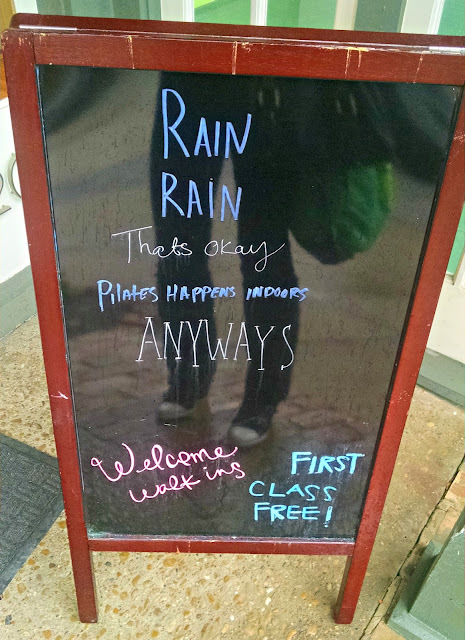 Pilates happens indoors anyways. One of the great things about Texas is the weather. As the saying goes, "If you don't like the weather, wait 10 minutes, it will change." (but they say that everywhere, right?). I was looking forward to the Dallas sunny skies again and I knew they were right around the corner. I accidentally signed up for an intermediate class. Oops. Class was held on the 2nd floor of an old charming building. There were only enough spots for about six mats and the class was full in the quaint studio. We were set up with a mat, a ball and a Magic Circle. What's a Magic Circle, you ask? The first exercise to utilize the Magic Circle was an upper body exercise where you simply hold your arms straight out in front of you gripping the circle while gently squeezing and releasing it with small movements. During these first few moments of class, I actually had this thought: "This is the kind of class they could do in an old folks home." Then almost immediately, as if a punishment from the Pilates Gods for mocking them, we did 50 additional minutes of exercises that made me feel like I was the one that should be in an old folks home and I permanently changed the name of the Magic Circle to the Wheel of Death. Well played Pilates Gods. I shall never mock you again. only a blogger would stand out in the rain to get a picture of a sign, right? All joking aside, the class lived up to its name "The Burner." I finished up the class with jiggly legs and a smile. As I walking out it became apparent that my attempts not to show my pain failed miserably, because the instructor said to me, "I hope you'll come back again. It doesn't get easier, it gets more achievable." "Burpees don't like you either." 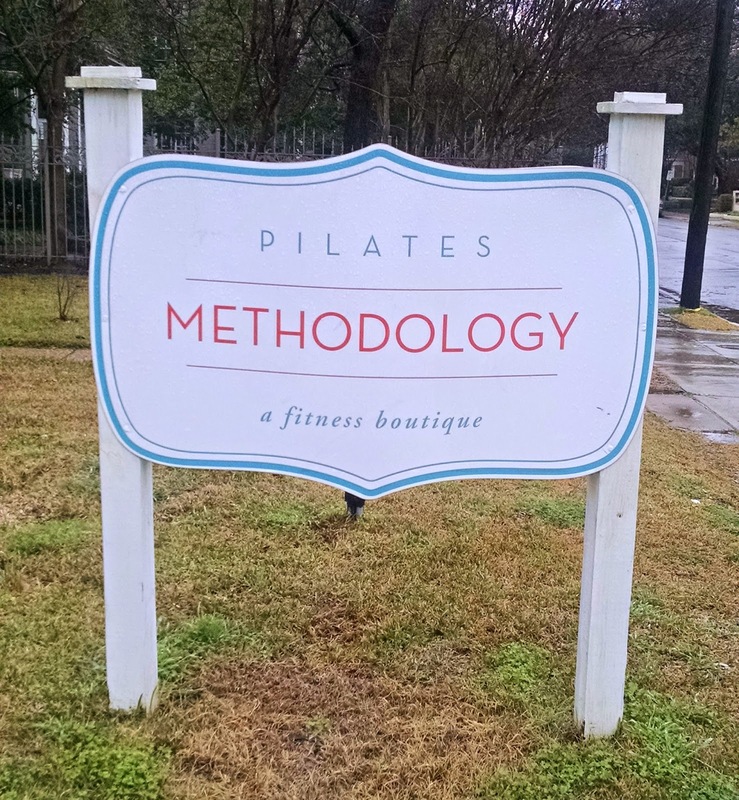 Day two of my tour, I was feeling a little sore from my intermediate Pilates session yesterday, but excited about my next stop at Dallas Strength & Conditioning: A gritty gym in a gritty neighborhood just outside the Oaklawn area. I wanted to make sure when I planned my schedule for the week, that I took a wide variety of classes, not just your typical studio classes. I have to admit, I felt a little intimidated walking through those doors. When I saw the dry erase board with the workout, the barbells and the weight stations I started to get a little nervous. I arrived early and chatted with trainer Chris for a few minutes before I realized it was almost class time and I was the only one there. I couldn't decide if I really wanted 20 people to show up at the last minute so I could hide anonymously in the crowd or if I'd rather that I ended up with a one on one personal training session. It turned out to be the latter, and I was so grateful for the personal attention. We did a few warm up exercises then moved right into a 40 minute intense fitness class. We moved through three circuits nearly twice, before the clock ran out. The circuits were a combination of cardio and full body strength training. We did exercises like burpees, barbell shoulder presses, lunges, kettlebell swings, wall balls and jump rope. It was very challenging for me, but with Chris' guidance I managed not to die. I kept thinking while I was struggling to lift a barbell over my head repeatedly or finish a set of any given exercise that Chris would say, "That's enough, let's move on." You know, the newbie pass, but he never did. He was amazingly kind and patient while pushing me finish every last rep. He would tell me to rest when I needed it and pushed me to get back to it as soon as I could. He made me do every last burpee. I couldn't decide if I hated him or loved him for it, but in the end I felt so amazing. This is the place to go to get strong. I will definitely be back. It was my third day in a row of my studio stops and I was really starting to feel it, especially after yesterday's tough workout. There was no time for wimping out, I had a class to attend! 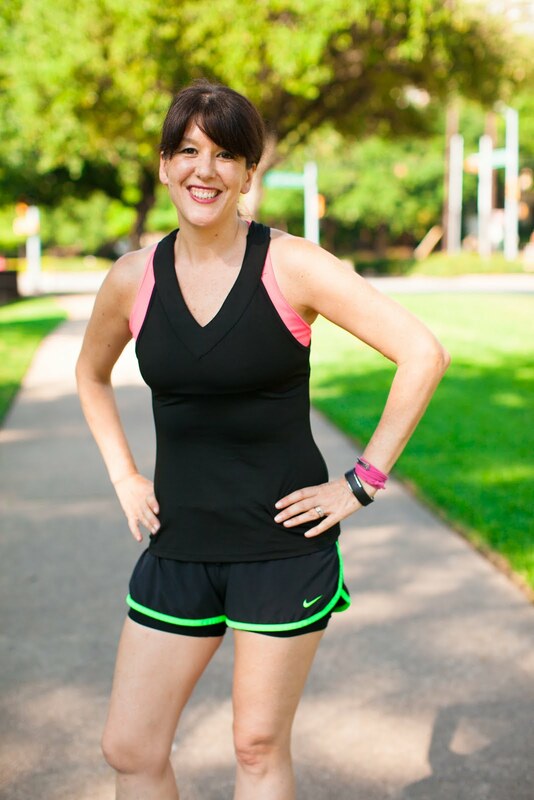 After another long day at work, I snuck out a few minutes early and headed up to Beyond500 in the Preston Hollow area for the the 5:30pm class. 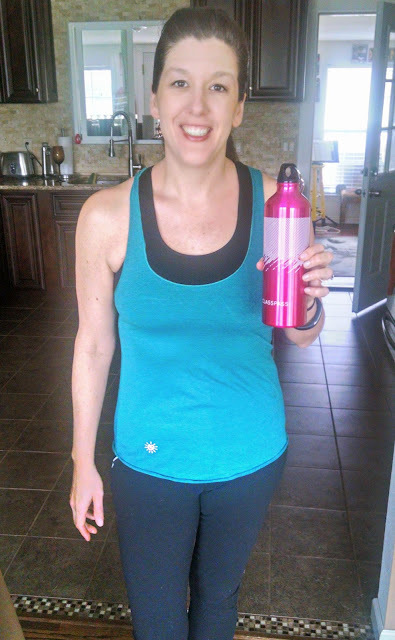 I have to admit I was hoping for something a little low key, but what I ended up with was a fun, challenging, energetic workout that flew by so quickly. The class utilized self-propelling machines that are like treadmills, but they are powered by your steps, so they don't plug in. The faster you run, the faster the belt rolls under you. If you want to speed up, you take bigger steps. As a regular treadmill user, it definitely took some getting used to! We did stacked intervals on the human hamster wheel, then moved to the floor for kettlebell and strength work, back to the hamster wheel for round two, then finished on the floor. 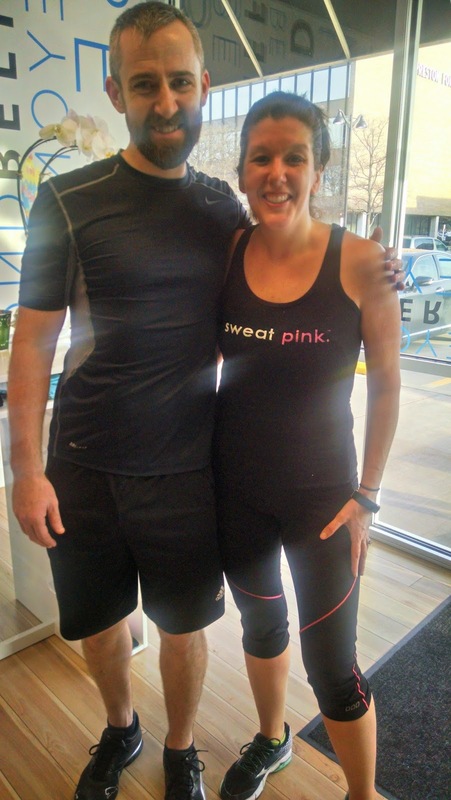 I loved the low impact, high intensity interval training of this class. 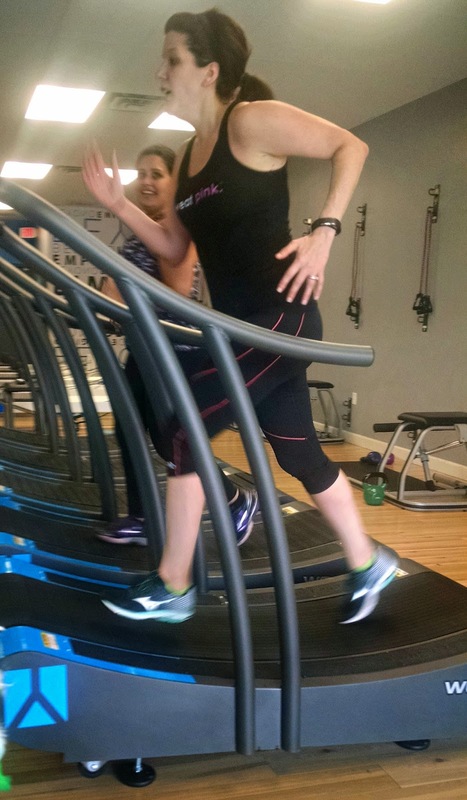 That human hamster wheel shot my heart rate through the roof, even when I was running at a slower pace than I typically do on the street or a traditional treadmill. I really want to visit this studio again so I can work on improving on this fascinating machine! On Thursday my co-workers laughed at me all day as I limped around the office from my oh-so-sore muscles. I was really challenging my body in new ways this week and loving every minute of it. I make jokes about torture devices, but the truth is that I love pushing myself a little harder. I may not be the strongest, but I enjoy getting out there and busting a sweat. I was scheduled for a Barre class on Thursday evening and I was a little worried. My sore muscles were really starting to catch up with me. I made a commitment to take a class and by golly (excuse the harsh language) I was going to give it my best shot. This class was scheduled to start at 6:05 and my schedule had been so tight all week, I was a little relieved for the extra 5 minutes for the commute and to get dressed. My stress level was low and I was headed up north again for yet another new class. I entered the address in my phone navigation and drove for about 45 minutes before the navigation lady who lives in my phone announced that I had arrived at my location. I looked around at the houses in the residential neighborhood and was thoroughly confused. There wasn't a Barre studio in sight. I called the studio and asked them exactly where they were located. Turns out there is a glitch with Google Maps and their location, and apparently this happens a lot. The very nice and understanding lady on the phone knew exactly where I was, which was about 30 minutes away from a class that was scheduled to start in 15 minutes. Thursday turned out to be an unintended rest day. I was feeling a little frustrated because I was missing a class that I really wanted to try and I was stuck smack dab in the middle of Dallas rush hour traffic trying to make my way back to Fort Worth. Once I made it home, I did a short restorative Yoga for runners session to ease my mind and body. I felt much better once I had the chance to get centered. Sometimes you just need to be flexible with your mind, body and your schedule. Maybe this rest day was just what I needed. I was feeling stressed. Stressed about leaving work early to make the 5:30 class. Stressed about time. Stressed about traffic. Stressed about parking. I was feeling pretty high strung and I was looking forward to this Yoga class to help me unwind. 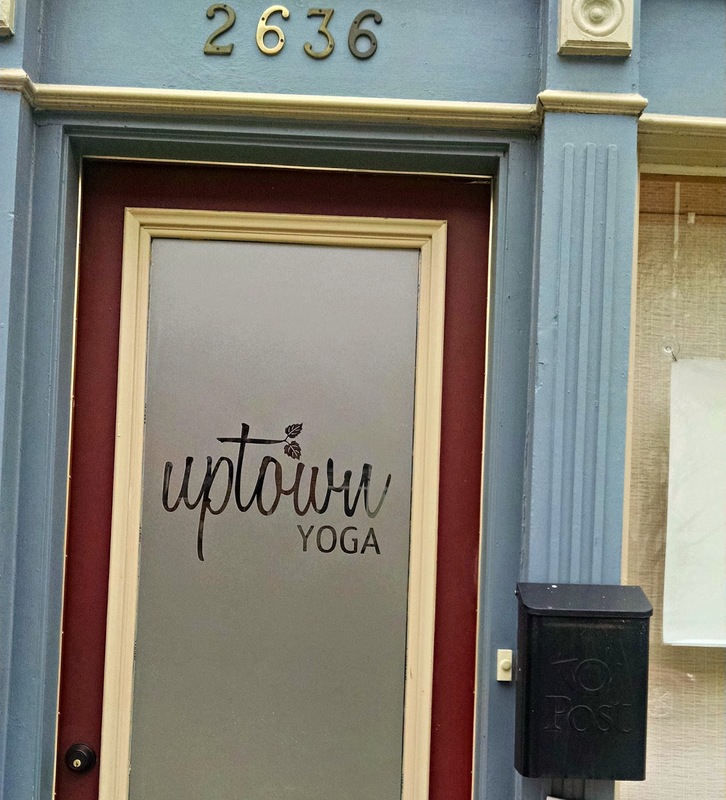 I snagged a parking spot on the street and headed into Uptown Yoga to change into my workout clothes for class. 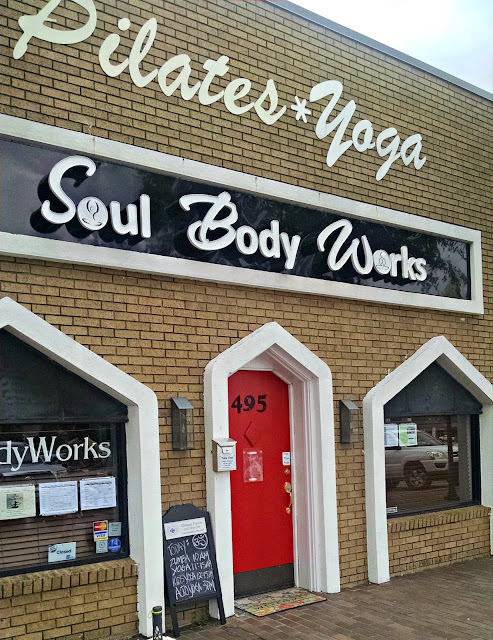 The class was packed with waiting Yogis in the large modern studio in Dallas' historic district. I found a spot on the floor and tried to relax before the class started. The room was a little warm, so even though the movements were achievable, I was sweating more in this class than I had all week. This was the perfect class to end a busy work (and workout) week. When they described the class as all levels, they really meant it. I am a beginner Yogi, I practice here and there, but not on a consistent basis. 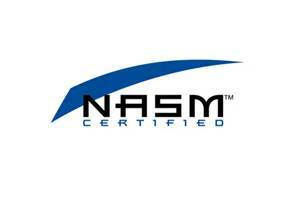 I was able to stay with the class for the one hour session without any problem. The soft spoken instructor always provided modifications for the more challenging poses. There were plenty of people in class just like me, but there were also advanced Yogis in class. I felt comfortable and relaxed. The Yoga flow gave my sore muscles exactly what they needed. I finished up that class feeling better than I had all week, both mind and body. After class I had plans to meet up with a fellow fitness blogger Mai Lyn from Deep Fried Fit at Alcove, located right around the corner in this trendy neighborhood. The evening air felt great against my sweaty skin as I walked a couple blocks to meet up with her. 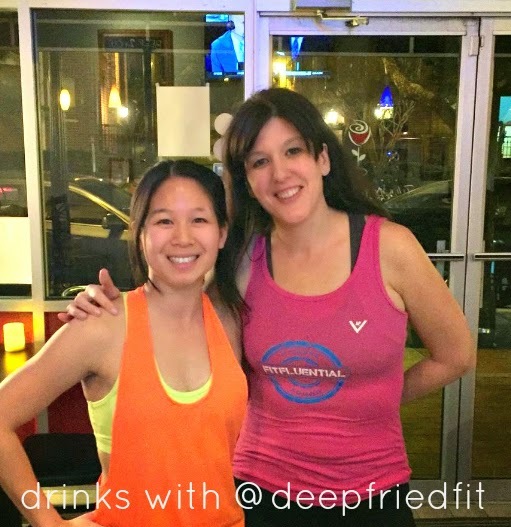 We chatted about fitness, Fitfluential and blogging over a glass of red wine. It was a perfect relaxing end to a busy week. "Comfort zone? What comfort zone?" It was Saturday and I was super excited. I was scheduled to take an AcroYoga class in the mid cities area near Fort Worth with a friend. I really had no idea what to expect. If I had known what I was about to do, I may have backed out before ever even attempting it. My comfort zone was seriously defied, but I came out of it feeling pretty great. AcroYoga is exactly what it sounds like: acrobats and Yoga. 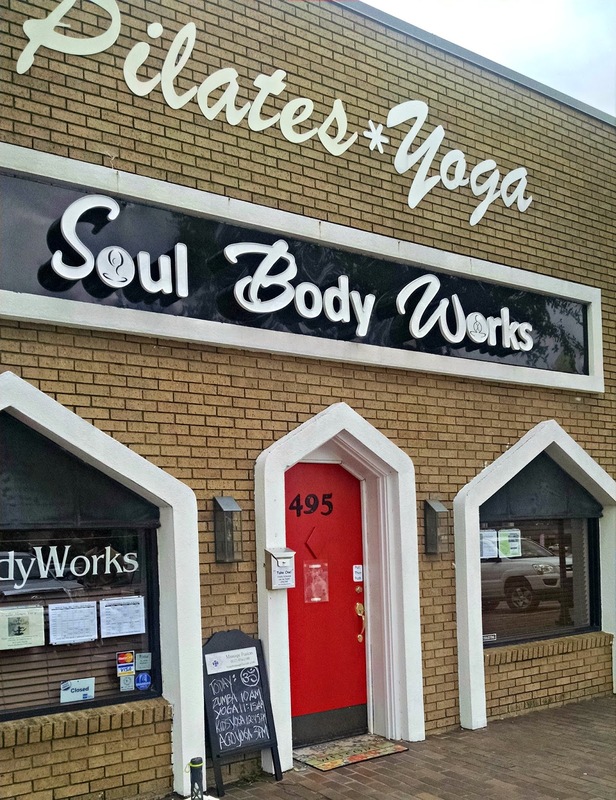 Within the first five minutes of the two hour class at Soul Body Works I was already feeling some serious internal pressure. I am the kind of person that takes time to warm up socially to new people (nice way of saying I'm awkward), and I immediately felt challenged. I wasn't sure that I could handle the kind of social and physical connection that AcroYoga required. Two Yogis work together to perform the poses. I had my best friend with me, but since we were both newbies, some of the positions required teaming up with the instructor or the other experienced people in the small class. It took a few successful moves, doing things that I thought I never would or could, before I started to loosen up and build my confidence. The group was so supportive, offering detailed guidance, patience, understanding, and most importantly, a spotter to make sure I didn't fall on my head. They helped me flip into positions that I couldn't get to on my own and gave me the confidence to try all sorts of new things. My friend did an especially outstanding job. She had the core strength to do really well. She also had the courage to step up and try things that I was afraid to try at first. 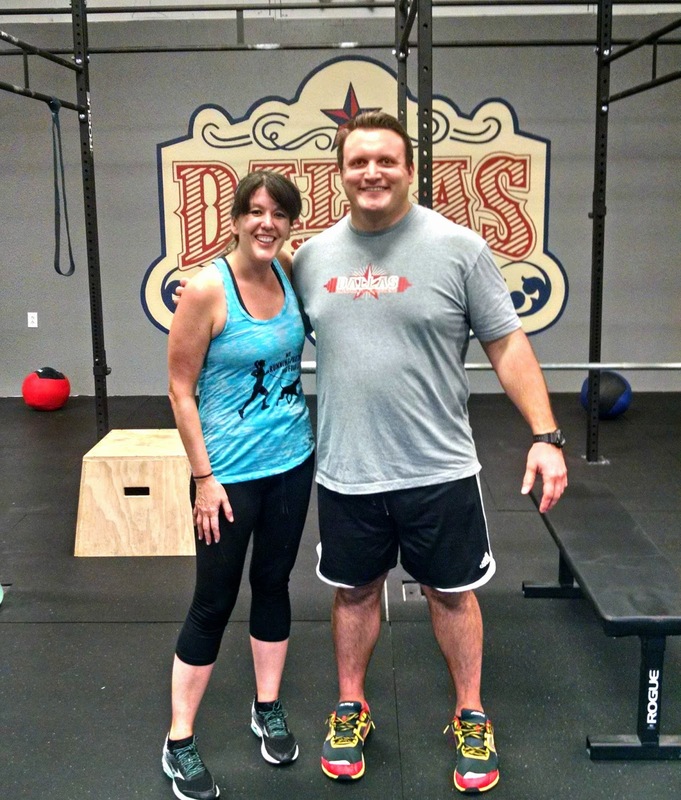 Her support and can-do attitude helped me realize that I could do it too. She did amazing and I was really proud of her. That's what best friends are for, right? The class was two hours long because it took time to do demos of each move and then allow every team to practice/perform the moves with others close by as spotters. Any less than two hours would not have been enough time. I left the class feeling fantastic because the people at the studio helped me do things that I wouldn't have thought possible. I was proud of myself and my friend. So glad I didn't let a little fear hold me back from something great. 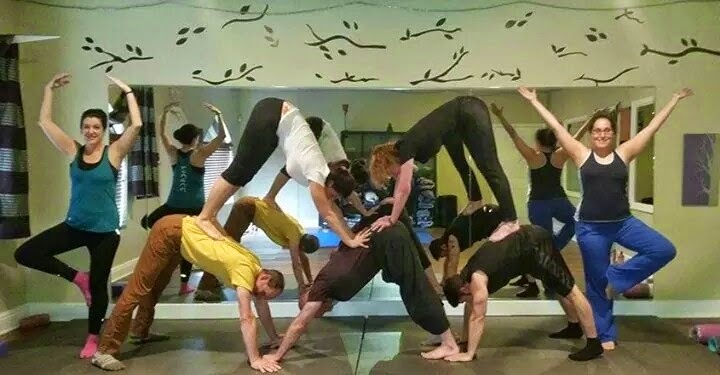 If you ever have a chance to take an AcroYoga class, I highly recommend it. Thank you for joining me on my studio fitness tour of Dallas. I had a blast and plan to keep trying new classes and revisiting some of my favorites (I will master that hamster wheel). 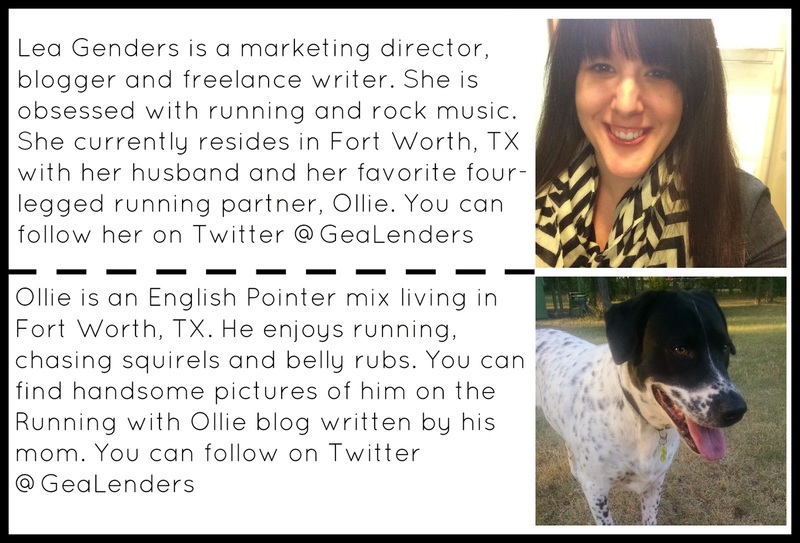 If you ever make it to Dallas, be sure to look me up, we can take a class together!